Although less than a mile, this loop around Mount Diablo's summit packs in a ton of long views and gorgeous scenery. For many of us, Thanksgiving invites gratitude. When I hike this loop, I feel immensely grateful for all the preserved open spaces visible from this beautiful mountain top. Many of my favorite peaks, including Mount St. Helena, Mount Tam, and even snow-capped Sierra mountains are visible from the top of Diablo on a clear day. If you have visitors from out of town, this is a great way to introduce them to the Bay Area landscape. Summer is hot and smoggy, but the rest of the year is wonderful. It's a long and winding drive to the summit -- bring lunch along and dine al fresco. 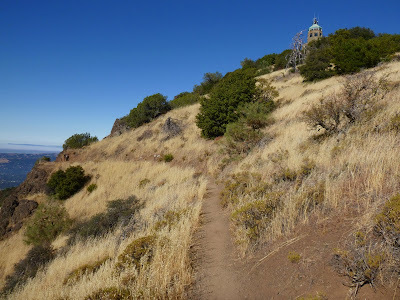 Diablo Summit is hike number 30 in 60 Hikes in 60 Miles: San Francisco (third edition). Read about this hike on BAHiker. Since we're enjoying mountain tops, here's another beauty: the summit of Mount Tamalpais. I often think as I hike some of my favorite trails, "if I lived here, I'd hike here every day." I really mean it when it comes to this hike. It offers amazing sweeping views and an incredible variety of native plants. If you want an easy hike, just do paved Verna Dunshee Trail. For more of a challenge, hike to the very toppity top on Plankwalk Trail.